March 3 – 14, 2017. Sizzle with South American beat of Tangos and Sambas on this ballroom dance cruise with Crystal Cruises. Improve your ballroom dance moves with our award-winning professional dance teachers. 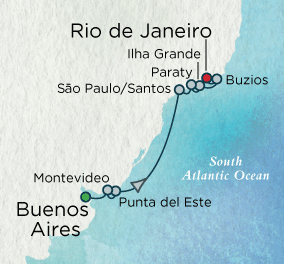 Discover South America’s Eastern Coastline including exciting Buenos Aires, colonial Montevideo, the splendid beaches of Buzios, Brazil, and the vibrant Rio De Janiero. Ballroom dance with us on Crystal Cruises and meet our award-winning and intentionally acclaimed dance professionals. Enjoy nightly dancing to live music, nightly shows, daily group dance lessons hosted by our Evia dance professionals, cocktail parties, and more. Complimentary enrichment via the innovative Creative Learning Institute® and Computer University@Sea® with classes in diverse topics such as world affairs, wellness, art, wine appreciation, digital photography and iPad filmmaking, fitness and Wellness at Sea® programs with classes in yoga, mat Pilates, Spinning®, and so much more! Ballroom dance on Crystal Cruises from Buenos Aires to Rio De Janeiro. Book a Veranda class or higher and get a 2-night Iguazu Falls Land Program included. Dance with Evia’s award-winning dance pros. INCLUDES: Shows, gratuities, gourmet meals, alcoholic and other beverages, group dance classes, hosted dance evenings, private cocktail reception, and more. Note: Inclusive/Complimentary 2-night expedition to Iguazu Falls land program begins March 1, 2017 from Buenos Aires and is available to guests booked in Veranda and Penthouse categories. This offer is currently sold out. *Price does not include port fees. Total USD includes dance fees. To check out some of our specialty shore excursions. Included: Group dance lessons daily with our award-winning professionals, nightly dance ambassadors provided by Crystal Cruises, welcome cocktail reception, all meals, alcohol, open-bar, gourmet meals, nightly entertainment. The All Inclusive Crystal Experience® is renowned for its ultra-luxe amenities and services, as well as unparalleled value and more. Not included: port fees, travel insurance, flights, personal purchases, consumer protection, private dance lessons available upon request, for those who want to participated in our group dance lessons and dance parties there is a fee of $295 USD per person, dance fees $300 US per person. Want to be a part of our dance group? We will have dance lessons most days from 4 PM to 4:55 PM. On March 7 , 12 & 13 lessons will be in the morning. Our dance pros will be available for group dancing in Palm Court during the evenings and for private lessons upon request. We will also have some specialty dance classes. Or telephone: 1-888-384-2669 or 514-344-8888 ask for Eva or Susie. *Note: A minimum of 15 guests is required by September 15, 2016 in order to guarantee this group.